Big, young power plants are closing. Is it a new trend? 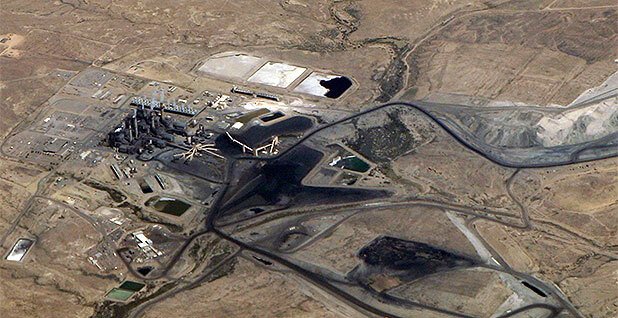 San Juan Generating Station in New Mexico could close in 2022, or three decades earlier than anticipated. Photo by Doc Searls, courtesy of Wikipedia. Many of the U.S. coal plants retired in recent years were geezers by industry standards. They trended old and small, and ran a fraction of the time. But in a vexing sign for the industry, those in the next round of retirements are decidedly middle-aged. Utilities have announced plans to close at least five coal plants since the start of the year. Of those, four boast a generating capacity greater than 1,000 megawatts, and all were built after 1970. By comparison, eight plants out of more than 150 retired between 2010 and 2015 listed generation capacity over 1,000 MW, according to an E&E News review of federal figures. All those larger facilities came online before 1970. Experts say it is too soon to say whether the upcoming retirements constitute a trend. The sample size is too small and, in some cases, the announcements are so recent that the plant's fate has yet to be finalized. It nevertheless represents a troubling development for an industry battered by years of low wholesale power prices, tepid demand and increasing competition from natural gas and renewables. "More and more people seem to feel comfortable saying we should invest in these other things rather than putting money in the coal plant or the nuclear plant," said Paul Patterson, a utility analyst at Glenrock Associates. Natural gas plants, he noted wryly, "are popping up like mushrooms after a rain." Retirements of larger plants hint at one of coal's greatest challenges. At a time when power prices are mired in the doldrums, coal plants are running less and less. Coal facilities generally shoulder high operating costs. They have large payrolls, consume millions of tons of fuel and are costly to maintain. Typically, that isn't a problem. By churning out enormous amounts of power around the clock, coal plants are cost-effective forms of power generation. But low wholesale power prices have scrambled that equation, with many power companies electing to leave their coal facilities idle for large chunks of the year. The U.S. Energy Information Administration estimates that U.S. coal plant run times averaged 52 percent in 2016, down from almost 60 percent in 2013. The decrease helps explain the recent round of announced coal retirements. In Florida, Jacksonville Electric Authority's St. Johns River Power Park ran 71 percent of the time in 2011, according to the company's fiscal 2015 disclosure report. That dropped to 51 percent in 2015. Jacksonville Electric Authority announced plans last month to close the 1,252-MW facility next year. The plant opened in 1987. In New Mexico, the 1,683-MW San Juan Generating Station saw its run time drop from 71 percent in 2013 to 61 percent in 2015, though it rebounded to 69 percent last year. Public Service Co. of New Mexico was already planning to close two of the 44-year-old plant's four units by the end of this year to comply with federal smog standards. The utility will now retire the remaining units by 2022 and completely divest itself from coal generation by 2031, according to a plan filed with state regulators this month. And in Ohio, Dayton Power & Light Co. (DP&L) recently decided to close the 2,318-MW J.M. Stuart Station after years of battling unplanned outages. The plant ran 48 percent and 54 percent of 2015 and 2016, respectively. While the problems there were as much operational as they were economic, the result was the same. J.M. Stuart will close in 2018, as will DP&L's nearby Killen Station. "The free cash flow profile for those plants going out for the next several years is in the hundreds of millions of dollars negative," Dynegy Inc. CEO Robert Flexon told financial analysts recently. "It's just too far out of the money." Dynegy jointly owns a stake in both plants with DP&L. The upcoming closures represent a stark change from previous coal plant retirements. Many of the plants to retire in recent years were among the oldest and least efficient in the generating fleet. While U.S. coal generation fell by 28 percent between 2012 and 2015, 5 percent of that decline was attributable to the 238 coal units closed over that period, according to researchers at Columbia University. Much of that decline, they found, was attributable to reduced electricity demand and coal plant running times. Even the largest plants to close between 2010 and 2015 were relatively old by industry standards. Six of the eight plants with capacity greater than 1,000 MW began operating in the 1950s. The other two began operating in the 1960s. The plants' advanced age made compliance with U.S. EPA's Mercury and Air Toxic Standards (MATS) costly. In all eight cases, utilities cited compliance with federal air quality rules as the reason for the shutdowns. By contrast, federal regulations have been notably absent from the retirement announcements this year. J.M. Stuart, St. Johns, San Juan and the 2,250-MW Navajo Generating Station in Arizona are all MATS-compliant. They are relatively new by industry standards. J.M. Stuart was the first to come online in 1970. And in each case, utilities cited economic reasons for the shutdown. John Larsen, an analyst at the Rhodium Group, stopped short of calling the recent announcements a trend. Coal units with generation capacity of less than 250 MW have made up 88 percent of the retirements since 2010, he said. But roughly 4 percent of retired units accounted for 20 percent of shuttered capacity. In other words, large plants have closed before. The wider market dynamics are more concerning for coal, Larsen said. For a power plant to make money today, it must be able to ramp up and down to coincide with the variable levels of renewable generation coming online. That makes combined-cycle natural gas plants profitable, even at lower prices. As for coal units, "they have relatively high and fixed operating costs and are relatively inflexible," Larsen said. "They make their money by running full-out. You might be able to survive a bad year or two. But when wholesale prices remain down, that business model starts to weigh thin." If the recently announced retirements are to remain an outlier, those broader market dynamics will have to change.